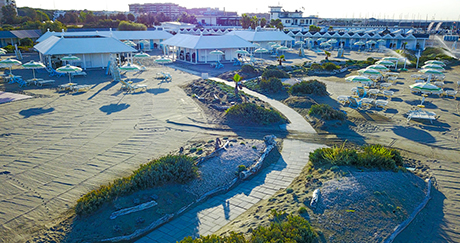 The Tsunami Surfing School, the only school for Windsurfing and SUP Ostia, is very sensitive to the living spaces during the lesions. Confined spaces or lectures held in free beach where all the swimmers disturb, do not belong to our school. With us, only restricted areas! Always believe that the livability of the place is a basic rule in order to learn all the lessons with confidence. We have a large area where, under a soothing coolness, theoretical courses are conducted. The sea trips take place outdoors only in areas marked by buoys so as to exclude the access of people not related to the course. We pay particular attention to the care spaces and their maintenance, especially to ensure greater peace of mind to children. Our instructors at your side throughout the training course. 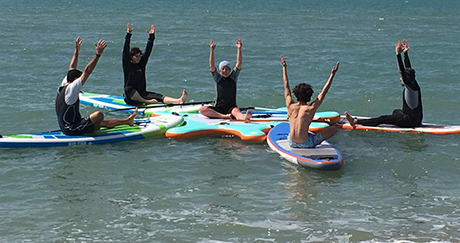 With our instructors, nothing is left to chance; We will follow whatever the situation by explaining, step by step, how to perform a maneuver or how to running on the waves. Children will find their availability equal to that of a great friend met at the beach during vacation. Secure areas of lawn to learn the best for the whole training course. Our spaces, are quiet and reserved at the School. In these areas, no person other than the students can access. Learn the theory on the simulator or know the winds described on blackboard in the classroom lessons will allow you to immediately learn all the secrets of windsurfing.